With the help of two young patients with a unique neurological disorder, an initial study by scientists at the National Institutes of Health suggests that a gene called PIEZO2 controls specific aspects of human touch and proprioception, a "sixth sense" describing awareness of one's body in space. Mutations in the gene caused the two to have movement and balance problems and the loss of some forms of touch. Despite their difficulties, they both appeared to cope with these challenges by relying heavily on vision and other senses. "Our study highlights the critical importance of PIEZO2 and the senses it controls in our daily lives," said Carsten G. Bönnemann, M.D., senior investigator at the NIH's National Institute of Neurological Disorders and Stroke (NINDS) and a co-leader of the study published in the New England Journal of Medicine. "The results establish that PIEZO2 is a touch and proprioception gene in humans. Understanding its role in these senses may provide clues to a variety of neurological disorders." Dr. Bönnemann's team uses cutting edge genetic techniques to help diagnose children around the world who have disorders that are difficult to characterize. The two patients in this study are unrelated, one nine and the other 19 years old. They have difficulties walking; hip, finger and foot deformities; and abnormally curved spines diagnosed as progressive scoliosis. Working with the laboratory of Alexander T. Chesler, Ph.D., investigator at NIH's National Center for Complementary and Integrative Health (NCCIH), the researchers discovered that the patients have mutations in the PIEZO2 gene that appear to block the normal production or activity of Piezo2 proteins in their cells. Piezo2 is what scientists call a mechanosensitive protein because it generates electrical nerve signals in response to changes in cell shape, such as when skin cells and neurons of the hand are pressed against a table. Studies in mice suggest that Piezo2 is found in the neurons that control touch and proprioception. "As someone who studies Piezo2 in mice, working with these patients was humbling," said Dr. Chesler. "Our results suggest they are touch-blind. The patient's version of Piezo2 may not work, so their neurons cannot detect touch or limb movements." Further examinations at the NIH Clinical Center suggested the young patients lack body awareness. Blindfolding them made walking extremely difficult, causing them to stagger and stumble from side to side while assistants prevented them from falling. 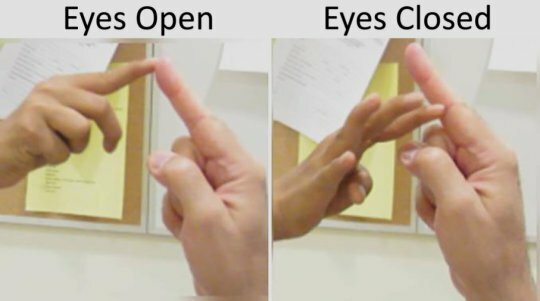 When the researchers compared the two patients with unaffected volunteers, they found that blindfolding the young patients made it harder for them to reliably reach for an object in front of their faces than it was for the volunteers. Without looking, the patients could not guess the direction their joints were being moved as well as the control subjects could. The patients were also less sensitive to certain forms of touch. They could not feel vibrations from a buzzing tuning fork as well as the control subjects could. Nor could they tell the difference between one or two small ends of a caliper pressed firmly against their palms. Brain scans of one patient showed no response when the palm of her hand was brushed. Nevertheless, the patients could feel other forms of touch. Stroking or brushing hairy skin is normally perceived as pleasant. Although they both felt the brushing of hairy skin, one claimed it felt prickly instead of the pleasant sensation reported by unaffected volunteers. Brain scans showed different activity patterns in response to brushing between unaffected volunteers and the patient who felt prickliness. Despite these differences, the patients' nervous systems appeared to be developing normally. They were able to feel pain, itch, and temperature normally; the nerves in their limbs conducted electricity rapidly; and their brains and cognitive abilities were similar to the control subjects of their age. "What's remarkable about these patients is how much their nervous systems compensate for their lack of touch and body awareness," said Dr. Bönnemann. "It suggests the nervous system may have several alternate pathways that we can tap into when designing new therapies." Previous studies found that mutations in PIEZO2 may have various effects on the Piezo2 protein that may result in genetic musculoskeletal disorders, including distal arthrogryposis type 5, Gordon Syndrome, and Marden-Walker Syndrome. Drs. Bönnemann and Chesler concluded that the scoliosis and joint problems of the patients in this study suggest that Piezo2 is either directly required for the normal growth and alignment of the skeletal system or that touch and proprioception indirectly guide skeletal development. "Our study demonstrates that bench and bedside research are connected by a two-way street," said Dr. Chesler. "Results from basic laboratory research guided our examination of the children. Now we can take that knowledge back to the lab and use it to design future experiments investigating the role of PIEZO2 in nervous system and musculoskeletal development." This work was supported by the NCCIH and NINDS intramural research programs. The above post is reprinted from materials provided by National Institutes of Health. Note: Content may be edited for style and length.